A picture is worth a thousand words – and a Picture Post is worth thousands of pictures. The Picture Post system is an easy-to-use and inexpensive tool for students, citizens, and community organizations to monitor change-over-time in their local environment and to share selected views of their local community with other people over the Internet. Contributors join a growing network of citizens around the world who are helping to create a data set – literally thousands of pictures – that will be invaluable for observing, monitoring, analyzing and ultimately understanding the changing conditions of the environment. The Picture Post activity also provides a rich set of materials and opportunities both for formal and informal science learning. A Picture Post is simply an octagon secured onto a flat surface and situated so that four of the faces point in the cardinal compass directions (N, S, E, W) and the other four faces point in the intermediate directions (NE, SE, SW, NW). Picture Post was created by the Digital Earth Watch project team working with several local park groups in the Boston, Massachusetts area that wanted a stable platform for people to use their digital cameras to take repeat photographs of not just one scene, but the complete 360º panorama. By using the platform, anyone can take a set of photographs of the complete landscape in less than a minute - and photographs taken at different times by different people will be aligned with other picture sets taken at the same location. These capabilities and a free website for people to save and share their photographs are the basis of our Picture Post system. Picture Posts can be built from scratch or octagonal platforms made from recycled plastic lumber can be purchased and attached to a free-standing post or existing structure. Free-standing Picture Posts have been installed in parks and on school grounds. Picture Post platforms have been attached to interpretive signs at nature centers and on boardwalks and viewing-platform railings in marshlands and coastal walkways. There is no limit to where a Picture Post can be placed – the major considerations are in making sure that the platform is situated so that the pictures capture the items of interest; the octagon is positioned using a compass; the post is accessible for use and maintenance; and that the installers have obtained permission for the post. It is not critical that the entire 360º landscape be included, making the railing of your home porch or deck an ideal location to put in a Picture Post and monitor change in your own backyard. There are many ways to take part in Picture Post activities. Anyone taking a walk outside who happens upon a Picture Post can stop and take photographs and upload them later to the Picture Post website. Persons or groups may regularly contribute photographs to a post in their local park or area of interest. Citizen scientists or community groups may create rough time-lapse animations of picture sets that show change-over-time. The most exciting way to participate is to set up your own Picture Post – by doing so you can monitor changes that matter to you most - be it landscape changes in your community from human activities or the timing of shrubs flowering in your yard. It is surprising to many people how quickly a picture set grows and how easily change can be observed. When setting up a Picture Post monitoring site, the most important question to ask is “What change do I want to observe and monitor?”. The answer to this question will help you to locate your Picture Post (one or more if necessary) and determine how often photographs should be taken to capture the change. Change takes place over both short and long time-scales. Pictures taken daily can capture phenological changes including leaf on, leaf off, first bud and first flower - or change in the water level of a stream due to rain events or drought conditions; pictures taken weekly can capture seasonal change; and pictures taken once a year can capture year-to-year changes such as annual tree growth or the spread of an invasive plant in a field. Using the Picture Post is easy. By taking pictures with the camera placed against each face of the octagon and one more with the camera looking up, the entire landscape is quickly captured with a total of 9 photographs. It is helpful to also take a picture of the post or the post signage for identifying the post later when uploading pictures to the Picture Post website. Picture sets can be taken as often as needed to capture events or change of interest. For most applications, weekly photographs augmented with daily photographs during the timing of important events, is a good standard practice. Sharing photographs over the Internet is a key component of the Picture Post system. Anyone can go to the website to view and download Picture Post pictures. You must register to upload pictures or add a site to the Picture Postnetwork. As the “owner” of a picture post site, you will be able to keep track of and manage picture sets that are uploaded to your post. Registered users can also make comments about any picture. The Digital Earth Watch team encourages participants to make useful comments, such as naming species of plants in a picture or commenting on the whether it was a particularly wet or dry season when the picture was taken, that could help in analyzing pictures at a later date. Registration is quick and easy, and participation in Picture Post activities, including uploading and storing of your pictures, is free of charge. Long-term monitoring is essential for researchers to detect and understand changes in the environment. Citizen networks such as Picture Post are recognized as essential for assisting researchers and federal agencies in collecting sufficient data necessary to understand changes in the environment that are happening now, to predict future changes and to plan strategies to adapt to climate change. A Picture Post network made up of students involved in community service learning, citizens, nature centers, researchers, and government agencies can work together to offer solutions to pressing problems associated with climate change. Picture Posts are valuable for teaching life, Earth, and environmental sciences at many grade levels and for low-cost environmental monitoring from local to global scales. Picture Posts empower the public to observe and document changes in their local environment that are of the most interest to them, to understand what they see in the context of global climate change, and to participate in a social network over the Internet that fosters sharing and the communication and knowledge that leads to action. Table 1 lists several uses of Picture Posts for environmental monitoring. Students, Tripp Clemens and Amara Frumkin (shown in the second picture of the chapter), and a science teacher, John Pickle, installed Concord Academy's first Picture Post on November 11, 2007. The post was located behind the school's chapel overlooking two sports fields, the Sudbury River and the trees along its banks, and next to a small maple tree. Since then, pictures have been taken on an almost daily basis. As the images have accumulated, new ideas for analyzing the images have developed, and the following are trends observed using these digital photographs. Because the post was next to a maple tree, the diameter at the same height on the trunk of the tree could be measured. The first questions were when did the tree begin to add wood to the trunk, whether the tree grew on daily basis, and when did it stop growing. 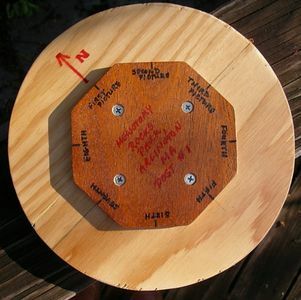 Below is an example of using the free AnalyzingDigitalImages software to measure the diameter of the trunk through a circular mark just to the right of the center. Another set of questions also arose as spring developed: when and how did the leaf canopy develop and whether the canopy growth influenced the timing of the trunk growth. Using the line tool in AnalyzingDigitalImages, the diameter of the maple's trunk was measured. find the same vertical position to measure each time. Example of how the leaf canopy fills in each spring for the maple tree beside the PicturePost. the area of the maple's canopy cover was measured. the first year growth observed with the Picture Post. What we discovered is the the tree did not begin to add new wood to the trunk until 90% of the canopy had filled in. This made sense to us since the tree needed to first put its stored energy into making the food producing leaves before adding wood to the tree. The graphs of the growth of tree trunk diameter and canopy cover plotted for the first three years observed with the Picture Post. It appears this scenario has held for the first three years of observations: the new wood begins to be added after 90% of the canopy is filled in. However, we noticed that the canopy was filling in earlier each year, so new wood was added earlier and continued to be added until the end of August. This means the tree is growing for a longer period of time each year. When the pictures were examined to see when the first leaf was observed each year, we confirmed that the tree's "green up" was occurring earlier each year to date. The fall foliage colors appeared to be particularly drab in 2011, but we wanted to check our recollection with the past years. Below are true color and enhanced images of fall foliage on October 12 for four successive years. The enhanced images are based on a mathematical comparison of the red and green intensities at each pixel in the image. If the intensity of red were greater than the intensity of green, the pixel would be shown in red but with an intensity set to the difference between the two colors. To minimize the effects of uneven illumination and clouds, the values were normalized by the sum of the two intensities. To read more about these color enhancements, see the DEW Investigation Adopt-A-Branch. Using the two sets of images, it appears 2009 had the dullest foliage, followed by 2011. The most intense reds and oranges (colors in which the amount of reflected red light will be much greater than the reflected green) occurred during 2010.